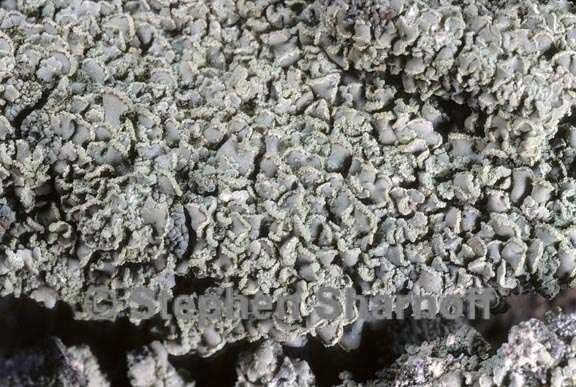 Thallus: squamulose squamules: up to 1.2 (-2.0) mm diam., normally ascending and geotropically oriented, weakly convex or strongly convex upper surface: grayish green or yellowish to dark brown, dull; margin: entire or slightly crenulate, not or slightly upturned, concolorous with upper side soredia: greenish brown, farinose to granular, in labriform soralia upper cortex: up to 40 µm thick, composed of thin-walled hyphae Apothecia: up to 1.5 (-2.5) mm diam., marginal, plane; disc: black, bluish white pruinose, egyrose; margin: remaining prominent, entire or flexuose; exciple: composed of loosely conglutinated hyphae, containing crystals (C+ red), colorless in inner part, green in the rim, K-, N+ violet; hypothecium: light brown or dark brown; epithecium: olivaceous green, containing crystals (C+ red), K-, N+ violet; paraphyses: without swelling or pigment cap in apical cell asci: remaining immature ascospores: unknown Pycnidia: sessile, black, attached marginally or laminally to the upper or lower surface or apparently directly to the substrate conidia: bacilliform, 5-7.5 x c. 1 µm Spot tests: upper cortex and medulla K-, C+ red, KC+ red, P- Secondary metabolite: lecanoric acid. Substrate and ecology: on bark and wood, often charred, mainly on conifers in conifers forests, at 290-3000 m alt. World distribution: Africa, Asia, Australia, Europe, and North America Sonoran distribution: Arizona, California, and Chihuahua, fairly common.